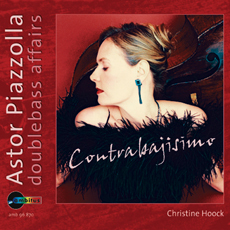 »It is a pleasure showing that the double bass is a very agile instrument,« says Christine Hoock. And because of this she dares to reverse the common roles and »polarities«: Suddenly a rather stolid instrument (if one goes by its image), the double bass, transforms itself in front of our very ears into an unexpectedly lithe, yearning, sensual, lyrical and highly nimble »body of sound«, surprising us with its range of tone and colour. Where there is sorrow there is also happiness, where there is happiness there is also pain, where the sun shines shadows can be found, and where there is light there is also darkness ...tango. Clear lines which allow for sumptuous creative possibilities, Authenticity which invites us to dream, Mischievous charm and bittersweet melancholy… the world is full of contrasts. But: A feeling of life cannot in any way be adequately portrayed by means of theoretical descriptions. In order to truly feel it, one must gain one’s own impression and be touched by it.